The monomials, binomials, trinomials and quadrinomials are as follows. (i) a2 is a monomial expression as it contains one term only. (ii) a2 − b2 is a binomial expression as it contains two terms. (iii) x3 + y3 + z3 is a trinomial expression as it contains three terms. (iv) x3 + y3 + z3 + 3xyz is a quadrinomial expression as it contains four terms. (v) 7 + 5 = 12 is a monomial expression as it contains one term only. (vi) abc + 1 is a binomial expression as it contains two terms. (vii) 3x – 2 + 5 = 3x + 3 is a binomial expression as it contains two terms. (viii) 2x – 3y + 4 is a trinomial expression as it contains three terms. (ix) xy + yz + zx is a trinomial expression as it contains three terms. (x) ax3 + bx2 + cx + d is a quadrinomial expression as it contains four terms. The terms of each of the given algebraic expressions are as follows. (i) 3x is the only term of the given algebraic expression. (ii) 2x and -3 are the terms of the given algebraic expression. (iii) 2x2 and −7 are the terms of the given algebraic expression. (iv) 2x2, y2, −3xy and 4 are the terms of the given algebraic expression. The like terms in the given algebraic expressions are as follows. (i) The like terms in the given algebraic expressions are a2 and −2a2. 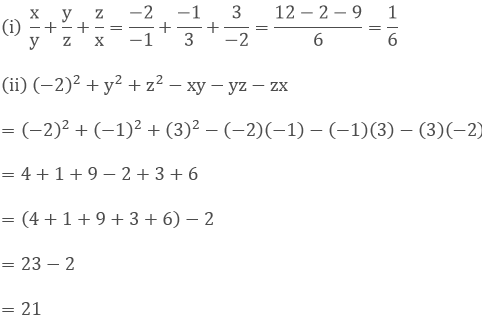 (ii) The like terms in the given algebraic expressions are -2yz and 5/2zy. (iii) The like terms in the given algebraic expressions are ab2c, 2acb2, b2ac and 3cab2. The coefficients of x are as follows. (i) The numerical coefficient of x is -12. (ii) The numerical coefficient of x is -7y. (iii) The numerical coefficient of x is yz. (iv) The numerical coefficient of x is -7a. The coefficient of x2 are as follows. (i) The numerical coefficient of x2 is -3. (ii) The numerical coefficient of x2 is 5yz. (iii) The numerical coefficient of x2 is 57z. (iv) The numerical coefficient of x2 is – (3/2) a. The coefficients are as follows. (i) The coefficient of y is -3. (ii) The coefficient of a is 2b. (iii) The coefficient of z is -7xy. (iv) The coefficient of p is -3qr. (v) The coefficient of y2 is 9xz. (vi) The coefficient of x3 is 1. (vii) The coefficient of −x2 is -1. The numerical coefficient of each of the given terms is as follows. (i) The numerical coefficient in the term xy is 1. (ii) The numerical coefficient in the term - 6yz is - 6. (iii) The numerical coefficient in the term 7abc is 7. (iv) The numerical coefficient in the term −2x3y2z is -2. The numerical coefficient of each term in the given algebraic expression is as follows. The constant term of each of the given algebraic expressions is as follows. (i) The constant term in the given algebraic expressions is -3. (ii) The constant term in the given algebraic expressions is 5. We have x = 1, y = -1, z = 2, a = -2, b = 1 and c = -2.